Nypave PX 50 is produced from selected bitumen feedstock, it is rheologically modified to deliver a range of enhanced performance options. Nypave PX 50 is produced according to the Nynas Sales Specification. Inchbonny bridge carries the former Edinburgh - Newcastle public road (now A68) over Jed Water. The existing single span reinforced concrete arch replaced the original hump-backed crossing in 1926 and has recently been showing its age. It was decided that this year, the bridge would be repaired and refurbished, including a new concrete saddle with asphalt above. One particular challenge was that, because of a very tight timetable, a substantial thickness of asphalt had to be placed in a single day. It was decided to use a lower temperature asphalt developed by Cemex and containing Nynas Nypave PX 50, a binder particularly appropriate for lower temperature asphalt mixtures. Nypave PX 50 falls into Nynas' "Extra" Performance Programme category, which focuses on bitumen with special characteristics and tailored specifications. Lower temperature asphalts - not surprisingly - cool more quickly than conventional hot mix asphalts and can withstand loading more rapidly. Use of the Cemex lower temperature asphalt meant that three layers could be placed within normal working hours during a single day. 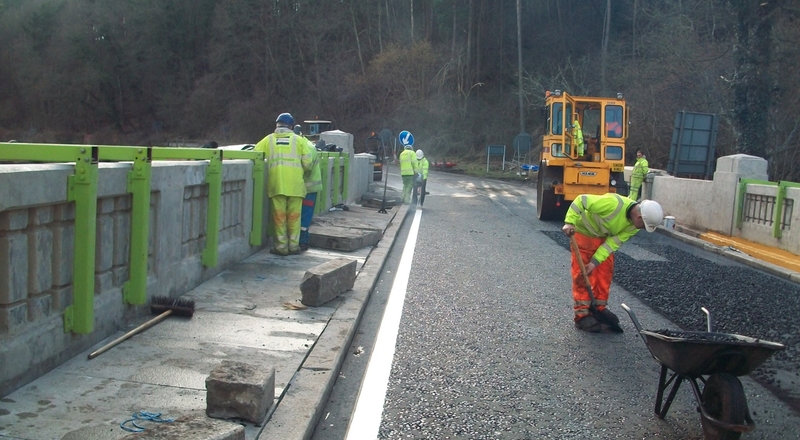 Reason for the tight asphalt programme at Inchbonny Bridge was the limited possessions allowed by roads operator BEAR Scotland, following consultations with local roads users. 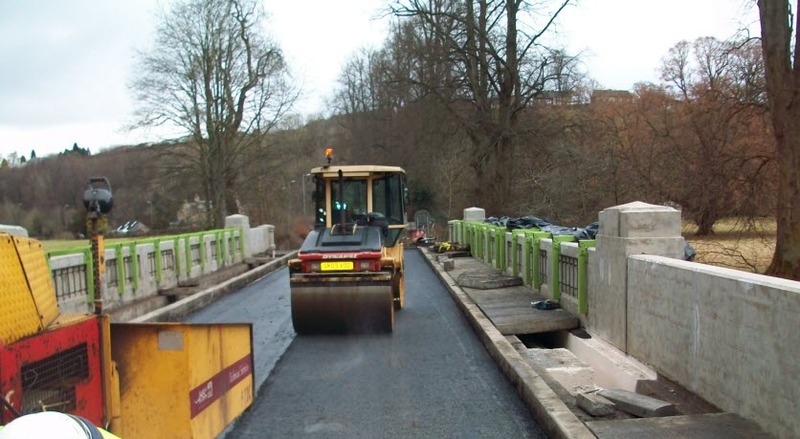 Main contractor Freyssinet Makers was permitted to close the bridge to traffic over three weekends only: one of them for erecting a temporary Mitchell crossing, one for shifting the Mitchell structure during the works, and one removing it and then carrying out the surfacing. Surfacing contractor SBc Contracts confirms there were only two days to place the asphalt course, a Saturday to lay the base course and the following Sunday for the other two courses. The base course was planned to be made up of three layers, an initial one of between 40mm - 100mm, a second of 100mm and a third of 100mm. The time taken by a layer of conventional asphalt at these kind of thicknesses to cool sufficiently for a subsequent layer to be added (plus the time taken by the laying process itself) meant that creating the bridge's base course could not be carried out in a single working day. Running a shift during the Saturday night was an option but against this was cost allied to the fact that no local quarries would be open. SBc Contracts knew of a lower temperature asphalt developed by Cemex that had been used on a time critical motorway contract. The company had heard that layers of this could be overlaid quickly, so contact was made with Cemex's technical staff in Scotland to find out whether the material was available. Cemex confirmed the availability and also the suitability of its specialist material. Its lower temperature asphalt is manufactured at around 145°C, about 30°C lower than conventional mixes. Cooling more rapidly, it is particularly suited to the kind of application at Inchbonny bridge where time was a serious factor and a number of layers have to be laid rapidly. Cemex pointed out that the challenge with temperature reduced asphalts in general is to retain workability of the mix, in particular the material's ability to be compacted; and the company emphasised the importance of the bitumen binder, Nypave PX 50, being used. In the event, the base course asphalt supplied to Inchbonny gave no problems at all: it fulfilled all requirements in terms of workability and compaction, speed of laying and end performance. Everyone was pleased with the result. The day after the base course went in, a 60mm thick binder course of 20mm heavy duty material was laid, followed by a 40mm surfacing of hot rolled asphalt. Soon after, white lining was applied and Inchbonny bridge fully reopened to traffic much to the satisfaction of locals and other users of the A68.